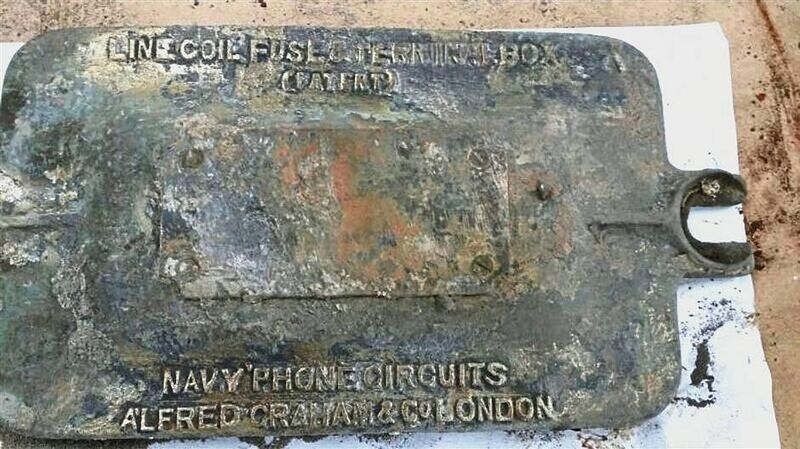 PETALING JAYA (THE STAR/ASIA NEWS NETWORK) - Some Malaysian salvage firms are working with an international syndicate to plunder sunken wartime wrecks in search for rare and highly-sought low-background steel, used in sensitive medical and scientific equipment. Evidence emerged at an Australasian Institute for Maritime Archaeology conference in Australia recently, indicating that the syndicate plundered the wrecks of 48 naval ships across South-East Asia, mainly around Malaysia and Indonesia. A source said the syndicate uses a grab dredger or crane barge to "fish" parts of the wreckage from the seabed. In Malaysia, the source said, the illegal salvage operation has already plundered 19 wrecks, mainly naval ships sunk during World War II. The source said that the syndicate has become very adept at avoiding maritime authorities. "They operate for a few hours each day and sail back out to international waters, where the authorities have no power to search or detain ships," the source said, adding that they return to the salvage work when the coast is clear. A Marine Department spokesman said it is aware of the syndicate's activities and has stepped up surveillance around shipwrecks in Malaysian waters. "We are working closely with the Malaysia Maritime Enforcement Agency to stop this illegal activity," the spokesman said. The spokesman also said the authorities are powerless to act once the culprits flee into international waters. PETALING JAYA: Low-background steel is steel manufactured before the atomic age. It was manufactured prior to 1945, when the atmosphere became contaminated by the atomic bombings of Hiroshima and Nagasaki during World War II, and subsequent nuclear testing during the Cold War. Global steel production has since seen an increase in radioactivity in the metal. This radioactivity affects metal used for ultra-sensitive scientific and medical instruments and equipment, producing inaccurate readings. Prior to 1945, steel was used in the process of putting the iron together to form structures or sheets. This kind of steel is very much in demand, a source said. The only problem is, almost all non-interference steel lies on the ocean floor, in the form of ships sunk before 1945. "The old sunken ships were not exposed to the air of the atomic age," said the source. This old metal is recycled and used to manufacture instruments used in medicine, light and radioactivity detection, and space exploration. The operation is driven by big demand and a lucrative payout for low-background steel in China. "The hunt for the steel has intensified in the last two years. "The metal is highly sought in China where it is used to make top-grade, sensitive medical and scientific equipment," the source said, adding that the syndicate has stepped up operations in South-East Asia owing to the great demand. It is learnt that the local arm of the syndicate is funded by its China counterparts, who hire and provide local salvage companies with the ships and manpower needed. "Their ships have a powerful magnet to 'fish' the metal from the deep," the source said. The crane lowers the magnet to grab metal from the rusted wrecks, which can be stripped easily. "A barge can be loaded with metal in just eight to 10 hours. "They then sail back to privately-owned jetties on the Selangor and Perak coasts to sort out their loot in makeshift junkyards. "These temporary junkyards are also their worksites, used to cut up larger pieces," the source said. The sorted metal is then taken to a legitimate junkyard, where it is packed or compacted before being sent to China. There, it is melted down for reuse. "In Indonesia, some private jetties and junkyards are even owned by syndicate members from China," the source said, adding that the salvaged metal is sold for between three and five times the market value of steel. The current price of steel is about RM300 (S$101) per tonne. The vessels, dredges and barges used in the operation may be registered to different owners, the source said, but they are all linked to one China-based company. At least eight of these ships are suspected to be in the Malaysia-Indonesia region, "not anchored at one location at any one time". "The ships, mostly captained by Chinese nationals with a dozen or so foreign crew, are spread across the Straits of Malacca, and the Java and Sunda seas," the source said. The ships sometimes sail for weeks without carrying out any actual salvage work, coming into port to refuel and resupply before setting out to sea again, the source added. 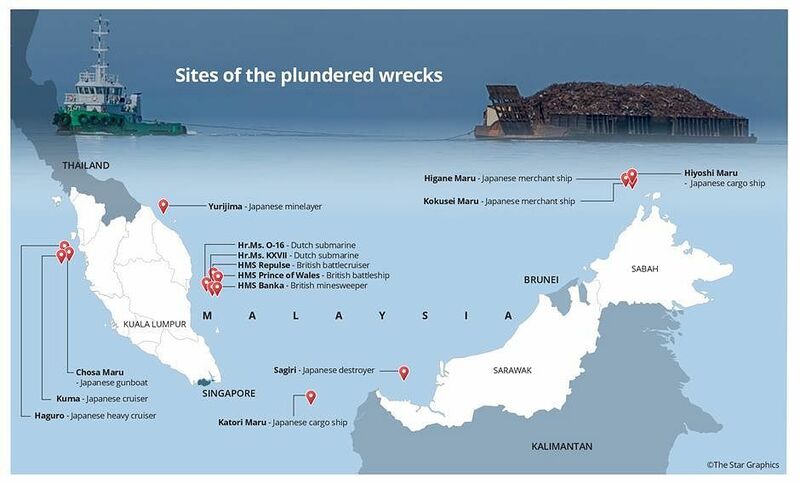 The Star reported three years ago that illegal salvagers had plundered at least five shipwrecks, including two Japanese WWII vessels, in waters off Penang. The rusted metal from these wrecks was sold for scrap to local dealers while the steel was sold to local smelting plants. Following the report, the Marine Department seized the ship and arrested its crew in the act off Penang. The owner of the company behind the salvage operation was fined RM70,000.